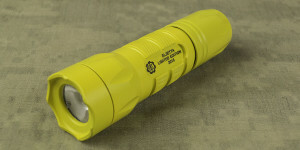 Representing the first retail offering from PK Design Lab, the PK FL2 LE is a compact handheld flashlight capable of producing up to 650 lumens with its Cree XM-L2 emitter. Powered by two 123A lithium primary batteries, the PK FL2 LE provides two modes of operation, a 650 lumen high mode and a longer-running 20 lumen low mode for up close tasks. Featuring a visually distinctive exterior design, the PK FL2 LE is available in a run of 1000 lights. 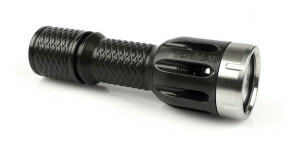 Each light is individually numbered and has a Manufacturer’s Suggested Retail Price (MSRP) of $190.00. The sample used in this review was provided by Paul Kim of PK Design Lab. The design of the PK FL2 LE relies upon extensive CNC machining for a unique look in a familiar form factor. The head, body, and tailcap are constructed of 6061 series aluminum and hard-anodized for resistance against corrosion and wear. The semi-gloss black finish is even and consistent across the various parts of the light and all laser engraving is sharp and legible. Five raised ridges spaced evenly around the circumference of the body are machined with various combinations of diamond and triangular shapes rather than conventional knurling. Ridges and flats on the non-removable head make the PK FL2 LE resistant to rolling when placed on a smooth surface. A distinctive aluminum bezel ring, more serrated than crenelated, caps off the head and provides protection for the borofloat glass window. 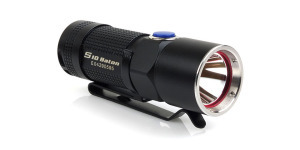 The bezel measures 1.25″ at the front making it compatible with the many beam filters and diffuser options available for the SureFire 6P and similar lights. Behind the anti-reflective glass window, a Cree XM-L2 emitter is centered in a machined aluminum reflector with smooth mirror finish. The tailcap of the PK FL2 LE houses the click-type tailswitch which allows momentary operation with a slight press and constant-on output with a full press and click. High mode is always selected first with low mode accessed by returning to off and pressing or clicking the switch again within 12 seconds. Laser engraving on the tailcap spells out “In God We Trust” and the manufacturer’s website address. To prevent accidental activation, the tailcap can be “locked out” by loosening it a fraction of a turn. Two lithium primary 123A batteries (not included) are installed by removing the tailcap. Double O-rings at the tail help the PK FL2 LE achieve an IPX8 rating against liquid ingress, according to the included user manual. The center of the beam is able to provide useful illumination beyond 100 yards and even the spill can reach out to 50 yards. The overall beam is fairly typical for XM-L2 based lights, with a creamy white center hotspot and a touch of green in the corona. The spill beam has a noticeable cool tint. The following slides compare the PK FL2 LE beamshots to a variety of other lights to provide some perspective of its output and beam profile. The beamshots can be compared across their full width using the slider and additional comparisons can be accessed by using the navigation buttons in the bottom-right corner of each image. Runtime tests of the highest output mode were conducted using 123A lithium primary batteries and a single Keeppower 16650 2000mAh lithium-ion rechargeable battery. The 123A batteries used in all runtime tests on FlashlightGuide are provided by the good folks at Battery Station. Powered by two 123A batteries, the PK FL2 LE remained in regulation for just over one hour with output dipping down to about 85% of its original level. It then saw a brief spike before beginning a long decline as the batteries were depleted. When operated continuously, the head of the PK FL2 LE heats up rapidly, approaching 130° Fahrenheit after one hour. The PK FL2 LE demonstrated good performance when powered by a single 16650 lithium-ion battery, providing more than one hour of regulated output followed by a steeper decline. Output is current controlled with no PWM. 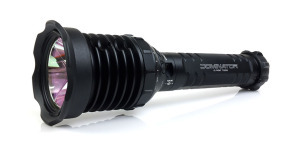 The PK FL2 LE is a powerful little light, able to throw a bunch of light into an area yet still small enough to carry comfortably. 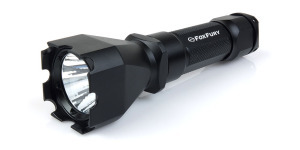 Its performance is on par with other lights in the same category and is very similar to the SureFire P2X Fury in terms of output and beam profile. The smooth aluminum reflector does a nice job of creating a clean artifact-free beam. Construction of the PK FL2 LE feels solid with all parts fitting together as they should and the hard-anodized finish appears to have no defects. The review sample I received is actually quite a bit lighter than shown in the manufacturer’s specifications, weighing in at approximately 5 ounces with batteries installed. As would be expected from its appearance, the PK FL2 LE is very secure in overhand and underhand grips due to the large number of design elements on the body and tailcap. It can also be very stable in a cigar hold although I found that grip to be uncomfortable due to the body ridges. Shifting my grip closer to the tailcap helped alleviate this problem but momentary activation of the light often resulted in a sharp corner on the tailcap being pushed into the side of a finger. Operation has been reliable and the user interface – press once for high, press again for low – is easy to use. However, the PK FL2 LE uses an abnormally long delay before resetting back to high mode after the light has been turned off. As a result, if the light is used in high mode and then reactivated after being off for only a few seconds, the user may be surprised by the light coming on in low mode. Most other lights I have used require only a couple of seconds before resetting to the default mode. This first offering from PK Design Lab has me looking forward to seeing what’s coming next from the mind of Paul Kim. 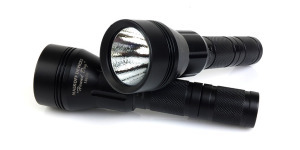 For more than 20 years Mr. Kim has played a role in designing some of the most popular and enduring tactical flashlights ever produced and his influence on the portable lighting industry can be seen in nearly every tactical flashlight on the market today. The PK FL2 LE is a nice light but I believe the best is still yet to come from PK. Lack of battery contact spring at the head can allow unintentional mode changes under hard use. The PK FL2 LE is manufactured in China and is available for retail purchase in the United States from Black Moon, LTD, located in Lake Havasu City, Arizona.